The Red Diamond Rattlesnake (Crotalus Ruber) is a species of venomous Pit vipers. There are currently three subspecies found. The Red Diamond Rattlesnake is a large species of Rattlesnake. It usually grows up to the length of 100 centimeters (39 in), but some males can grow up to the length of 140 centimeters (55 in). The largest ever found was 162 centimeters (64 in) long. Its pattern is similar to the "Western Diamondback Rattlesnake", but the Red Diamond Rattlesnake has more of a reddish color on it. This snake has many names like the "Red Rattlesnake", the "Red Rattler", the "Red Diamond-backed Rattlesnake", and the "Western Diamond Rattlesnake". 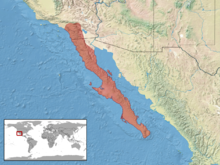 The Red Diamond Rattlesnake lives mainly in deserts and on mountains in Southwestern California, U.S.A, northeastern Baja California, Mexico, and islands in the Gulf of California like Angel de la Guarda, San Macros and Monserrate. It eats mainly rabbits, ground squirrels, and birds, but sometimes they eat lizards and other snakes. Red Diamond Rattlesnakes mate in February and April. Females have their babies in August; they have around 3 to 20 babies at a time. The babies are born 30 to 34 cm long. Crotalus ruber at the TIGR Reptile Database. Accessed 12 December 2007. This page was last changed on 2 February 2018, at 06:56.